It’s been just a few days since the iPad Mini made its debut but a Chinese manufacturer has already launched their own version of the smaller-sized tablet called the GooPad Mini. If you agree with us that the iPad Mini is still quite expensive, then you may want to check out its more reasonably priced clone from GooPhone. 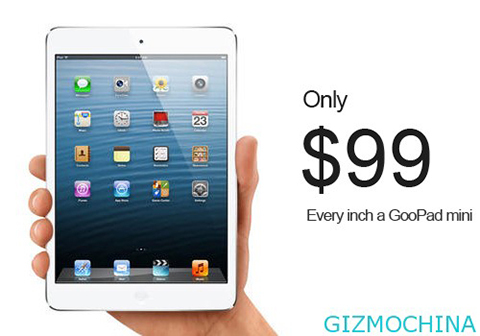 The device costs around a third of Apple’s asking price for the 7.9-inch iPad Mini at just $99. For that much money, you’ll be getting the following specs — 1.4 GHz dual-core processor, 1 GB RAM, 8 GB internal storage and a 2 MP main camera supported by a VGA shooter in the front. Of course, since it is trying to ape the iPad Mini, it copies the same 7.9-inch display size. Not surprisingly, the device doesn’t come with Apple’s own OS but with a modified version of Android Jelly Bean that comes with a launcher that passably imitates the iPad Mini’s iOS. The GooPad Mini will be widely available across China starting next month. And while we were expecting copycats to release their own versions of the iPad Mini, we weren’t expecting them to surface this quickly. Could a lawsuit from Apple be that far behind? What do you think of the GooPad Mini? Do you even seriously consider getting these premium-brand knock-offs just because they’re cheaper? Share your thoughts in the comments below!